Delegations from 30 foreign Communist and anti-imperialist Youth Organizations from all over the world participated in the proceedings of the 12th Congress of the KNE and addressed greetings to the Congress. 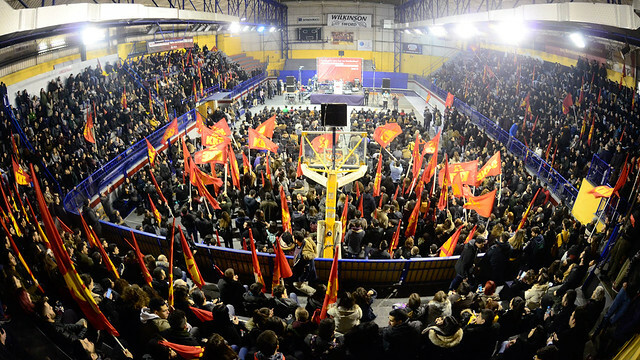 The foreign delegations participated in the mass, militant internationalist event in solidarity with the people and the youth of Venezuela, on Saturday 16/2 evening that was organized by KNE under the central slogan “Solidarity to the people of Venezuela! No submission to imperialism; the only superpower are the peoples. Finally, during the days of the 12th Congress, a meeting of the European Communist Youth Meeting Working Group was held which decided that the 15th Meeting of European Communist Youth will be hosted by the Communist Youth of Austria in Linz (Austria) on the 28-30 June, 2019.